Hi everyone. We have been overwhelmed these past several months rescuing cats & kittens (and even a few dogs) and our ability to post NEWS regularly on this page has been affected. But, our FACEBOOK page is alive & well and we invite you to join us there. Just click here or go to www.facebook.com/passionfourpaws and discover what we've been up to. See you there! Read more about JOIN THE CONVERSATION ON FACEBOOK! 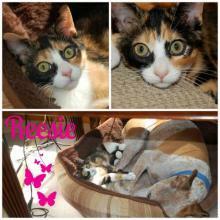 Read more about Congratulations Reesie! Congratulations Gianni Merola! Gianni and his new dad Mike will keep each other company watching football, baseball, and other sporting events. In fact, they made it home just in time for the Red Sox game. Have a great life Gianni! Read more about Congratulations Gianni! Heather's new mom Barbara just sent us this picture of Heather lounging on the couch. 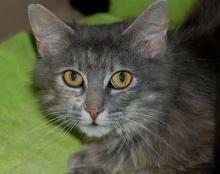 She reports that Heather is hiding less as she becomes more comfortable in her new home. Heather is the first one up for breakfast each morning, and even though she and Nicky each have their own plates, they prefer to eat from the same one. They like to share the litter box too, but other than that (according to Barb) they act lilke they've never met! Read more about Looking Good Heather! Just delivered MISS MONKEY DEVOE to her new home! She joins mom Kristen, dad Edward, and canine sister Addison (who will most likely become her new best friend within the next 24-48 hours). 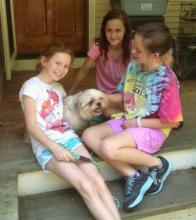 Monkey is a big dog lover, so she was very excited to be adopted into a home with a friendly dog. Congratulations MONKEY! Read more about Congratulations Monkey! When we adopted Harper out just over a month ago she weighed 9 lbs. Ten days later she weighed 13 lbs. 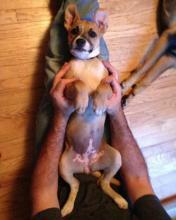 We went to visit her the other night and she has practically doubled in size, weighing in at a whopping 21 lbs! Oh my goodness, she's gonna be a big girl! And she was so happy to see us, which makes us feel very good inside. She is in the perfect home and we couldn't be happier for her. Keep in touch Harper! Adopted together just a few weeks ago! Read more about Congratulations Alfalfa & Spanky! Gentle Heather came in with her kittens a few months ago. Of course the kittens were all adopted out immediately, but Heather, just a baby herself at under a year old, was overlooked time after time. Until now! New mom Barbara came to our kitten adoption event last Saturday, but wisely decided to adopt an adult cat to be a companion to her cat Nicky. We applaud Barbara for making that decision since adult and senior cats are so often overlooked in the shelters. Read more about Congratulations Heather! 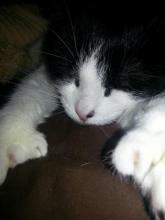 Just received a lovely photo of Tuxy sleeping on mom Sylvie's bed. Tuxy was just adopted a few weeks ago! CONGRATULATIONS TOBY!!! You're adopted!!! It doesn't get much better than this, does it? Read more about Congratulations Toby!